Last week we informed you about the first evidence, which hinted towards the possible existence of iPhone OS 3.1.3, and iPhone 4.0 firmware. 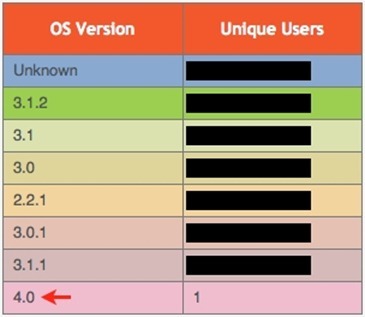 Today, MacRumors has been tipped by a developer who has spotted a single instance of iPhone OS 4.0 being used in his application’s Pinch Media analytics data. This discovery corresponds to the discovery of “iPhone 3,1” (the next-gen iPhone 4G model), which was spotted by the developer of iBart app last month. If iPhone 3.1.3 indeed exits, we expect it to be a minor update and it may release in the first half of 2010. The 4.0 version certainly denotes a major release version and we can expect it to ship with the next-generation iPhone model which is expected to be released in summer, at the annual WWDC 2010. Nothing much is known about about the features that the new firmware is going to offer, but we can expect it to add alot of new features, similar to what was experienced when firmware 3.0 was released. Very interesting… I can't wait to see the features! Hopefully FM radio. Please. i see this iPhone 4.0 everywhere based on server logs of visits..
Don't think that wouldd happen because iPhone would have to have a FM receiver built into it so they might just make another iPhone with one in it. Iphone already has a FM transceiver in it. That's how it communicates with that stupid nike shoe. It's just a matter of Apple unlocking it.